One of the biggest challenges facing any young musician today is how versatile you have to be to make a living. At the drop of a hat you have to be able to switch from opera to close harmony, sometimes even within the same concert! 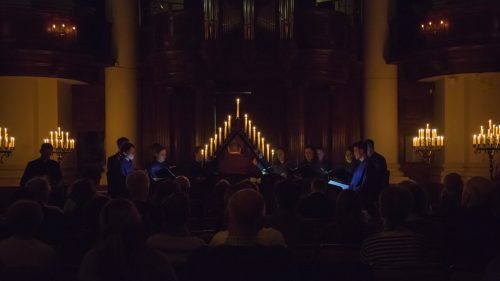 When I first saw the programme for the Tenebrae Holy Week Festival, I realised that it was going to be a real test of my versatility, not to mention my stamina! Within the space of a few days I would have to sing the Fauré Requiem, interspersed with Bach chorales, followed by a large helping of Renaissance polyphony and plainchant. Oh and in the middle of it there was a solo Messiah for the Associate Artists to tackle as well. Despite the challenge, I was very excited to have a week filled with such fantastic music. For Tenebrae, Holy Week began with Bach and Fauré. The first half consisted of Bach Chorales, broken up by his Partita No.2 in D minor performed by the wonderful Max Baillie. His playing was electrifying, and was especially memorable for some unbelievable quiet passages. The chorales and partita were then combined together for the Ciaccona, a fascinating aural experience.This created an atmosphere of palpable reverence which was shattered as we segued into the dramatic unison D that opens the Fauré Requiem. We performed this with the Aurora Orchestra and with James Sherlock on the organ. The orchestra sounded amazing, creating a warm and beautiful sound that merged perfectly with James’ musical organ playing. The Fauré is a piece I’ve performed many times, but this interpretation was honestly the most memorable I have ever taken part in. No sooner had we got offstage, we had to gear ourselves up for our first liturgical event. We would perform three of these on consecutive days during the festival; each of them would feature selections of the Victoria Tenebrae responses, with short biblical readings in between. In the first two, we also performed Tallis’ Lamentations. 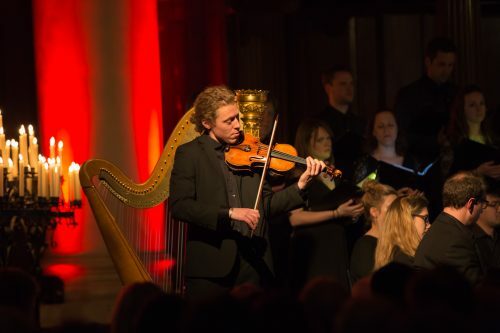 Performing this masterful music in the beautiful surroundings of St John’s Smith Square was a delightful, and in the candlelight the atmosphere really was amazing. In between these services, the Associate Artists sang the solos for a Come and Sing Messiah at St John’s. This presented an altogether different kind of challenge for us, as solo singing presents a very different kind of challenge to the ensemble singing we’d be doing! The choir made a terrific sound, and it was pleasure to share the stage with my colleagues, who sang beautifully! Performing so many amazing pieces of music in such a short space of time was certainly a challenge, but one I enjoyed immensely. It’s fantastic that Tenebrae’s Associate Artist scheme gave all of us that opportunity, as there is no doubt we will all have to be able to be as versatile as this in our careers. Not only was it a fantastic experience educationally, but musically it was a truly memorable week for me, and I’m sure it will stay with me for a long time.